Plastic Canvas Mini Magnets Pattern. 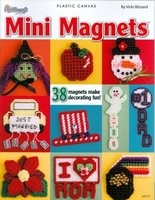 You get patterns for 38 magnets in this plastic canvas mini magnets book. There is something for every holiday including 50th anniversary, it's a boy, just married, happy birthday and number 1 dad. This is a must have book for anyone who to stitch. These magnets are mini in size so they stitch up quickly. They are all stitched on 7 count pc. Whether you are looking for items to make for your craft fairs, a new holiday decoration or something small to place inside a greeting card you will have many magnets to choose from. This is a needlecraft shop book and has 32 pages.